Shopping With "Warren Buffett of Coupons"
Grocery prices are shooting up, but the "Warren Buffett of coupons" says there are ways to slash what you pay at the checkout counter. Teri Gault, the founder and CEO of The Grocery Game, a members-only website that claims to save a family of four more than $500 per month, says savings start with sales. "You always want to shop with what's on sale," she said. 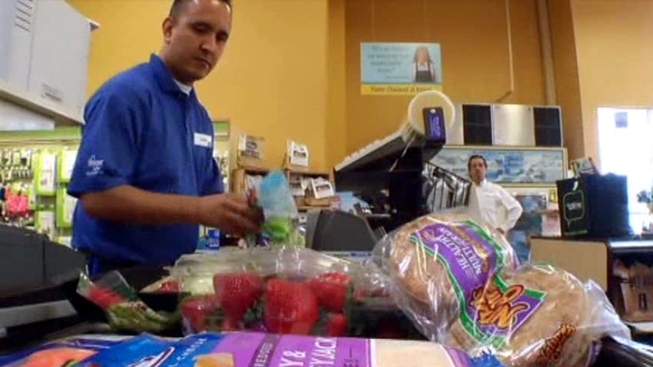 On a recent shopping trip with NBC 5's Ben Russell, Gault found $105 worth groceries for $49. "We have $9 worth of coupons," she said. "It's really all about the sale. There's the $46 worth of sale, so all together, with the sales and the coupons, it's $55. That's smart shopping." Gault says shoppers shouldn't just buy the first thing they see. Instead of picking up the strawberries featured in a big display near the entrance, Gault pointed to smaller containers advertised in the store's circular. Those strawberries were $1.50 each -- or $3 for two pounds instead $3.88 for the two-pound containers in the big display. "But I always say shop the big picture -- shop what's on sale," she said. "Stacking" -- or buying an item using a store coupon and a manufacturer's coupon -- is another important strategy. Gault picked up laundry detergent listed at $5.29 per bottle. "But with the coupon and the sale, it's $1.99 each, so we wash our clothes for cheap," she said. Gault said shoppers should avoid shopping by need. Shoppers who make a shopping list each week of the items they're out of are "forced to pay full price for about eight out of 10 things" that go in their cart, she said. That means shoppers need a plan. "You need to know what you're getting, when you're going to get it and on what day," Gault said.